How do you buy a steak? Farmers raise and sell cattle of any of the 60 cattle breeds. It is sold at auction as lots to the highest bidder. It's processed and it is graded by the USDA. Before a distributor gets it for distribution, selected lots are hand picked and depending on who buys it and for what reason, some lots are much better than others. If a buyer represents a steakhouse like Peter Luger's, the buyer is focusing in on a specific grade---Prime, a specific yield grade (fat to meat ratio) and cattle type. The buyer is willing to pay a premium for the lot of beef loins as are other bidders from other companies like Morton's Steakhouse, the Palm or any number of high-end distributors who specialize in prime beef. The competition is stiff for this small amount of beef and that is one reason the prices are so high. Aside from this ultra-competitive purchasing circle, we also have high quality meat purveyors competing for the remaining prime and top range of the choice graded beef. The remaining "next best" beef goes to supermarkets, they want their share too! They usually purchase from the middle of the Choice grade. Some supermarkets don't want the Choice beef either! The profit margins aren't as good, so many markets purchase the third best called the Select grade. If you noticed the pictures of the meat below you will see the Select grade is much leaner than the Prime or Choice, it is still wholesome and good, but it won't be as tender, flavorful and juicy as the 2 other grades. On the other hand, if you are using it for pot roast or stew, you probably won't notice the difference!If you want to learn more about the subject, search the Internet using the keywords, "prime beef", "beef grading" or "raising beef cattle". The best grade of beef is USDA Prime. This grade is earmarked for the finest cuts that conform to the complex grading formula that the USDA applies to the inspection of beef. It comprises less than 2% of all graded beef. It has an abundant amount of marbling (the network of fine lines of white fat). This marbling, as well as other factors such as feed quality, and aging, adds to the rich flavor and fine texture of the best cuts. Prime beef tends to be found only in restaurants, fine butcher shops, and custom or specialty suppliers of beef. USDA Choice is the next best grade of beef. Choice can be nearly as good as Prime, especially in the top 2/3 of the grade. Generally, it tends to have a little less marbling (and therefore less complexity to the flavor) and a slightly tougher texture than Prime. Choice is usually the highest grade found in grocery store meat departments, although some chains may custom order prime cuts for large purchases. USDA Select is the next grade of beef. This grade can be nearly as good as Choice grade (in the top 1/3 of the grade). Select has less marbling than Choice, and will have even less complexity to the flavor. Select can be somewhat more tough in texture. Select can dry out easily when overcooked, especially as steaks. It is the most common grade of beef available to, and bought by, most people. Now the crazy thing: this is why the meat is federally inspected and graded---to assure consistency within the grading process. Let's say a rancher sells 100 head of cattle, it is inspected, graded and processed---12 are graded Prime, 35 Choice, 40 Select, 10 Standard and 3 Commercial. The 12 Prime are swooped up as well as most of the Choice, by buyers representing steakhouses and meat packers; supermarkets take the remaining Choice and Select pieces. What is left goes into the ground beef market and is processed as hamburger patties and is sold and distributed world wide to anyone from Burger King to Wendy's and from Wal-Mart to Costco. This is what you get when you buy the 5 pound box of 1/4 pound frozen hamburger patties from any of the aforementioned stores. Remember---it's good and it's wholesome, but it's not good enough to be a steak. More confusion: the lower graded cattle may be from the best breeds of beef cattle. Where do you buy a good or even great steak? First you should know that it will cost you more money for a steak this year than last year, and this will be a continuing trend. Beef prices are up world wide because of demand, fear of mad cow, and the Atkins high protein diet. Supply simply can't keep up with demand anymore. Some supermarkets, including Whole Foods, have systems in place so that the beef they buy meets certain specifications of quality. In fact most restaurants have specifications they give to their meat suppliers that detail the quality level they are looking for. Without this "Specification Sheet" there would be no consistency in what was received from week to week. As a consumer, you will have to trust your butcher and hope they are buying better than average beef. Ask questions and become educated so you know a little about what you are buying. 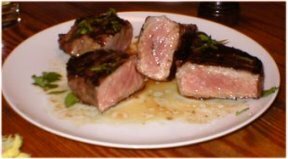 I've had as many great steaks from the former Balducci's in New York City, as I have had from a supermarket called Stop and Shop. I knew what I was looking for; what cut of steak, the color of the meat, marbling, grade, size of the steak in roundness. Balducci's sold Prime sirloin strip steaks at 16.95 a pound and Stop and Shop sold Choice Sirloin strip steaks at 6.99. The Stop and Shop was almost as good! Was it worth the price difference? To some it is! This steak is what you will find in most supermarkets in the USA. It's Choice grade and called a Sirloin Strip or Boneless Top Loin Steak. After opening the package it will require a little additional trimming before cooking. Certified Angus Beef and other brands like it. Back in 1978 a beef program was formed between the American Angus Association and beef produces, packers and distributors. The goal was to provide assurances of a certain level of quality and flavor for consumers. The result was Certified Angus Beef or CAB for short. CAB states that less than 8 percent of beef produced in the USA can earn the distinctive Certified Angus Beef brand stamp. I can attest to the consistent quality of the brand and often seek it out for my personal consumption. This registered name is sometimes misused by those who want to confuse you and make a quick buck with lesser quality beef. 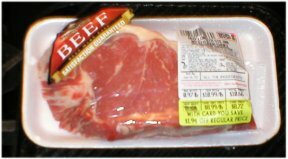 Most copy-cats claim either Certified Beef, Black Angus Beef, Angus Beef and or any combination of words, label design and or color. It's like buying Kellogg's Special K and getting a generic brand because you thought it was Kellogg's since the label and color of the box looked the same. Because of the CAB success other meat companies have developed similar lines and claims. The following are examples of just 2 other premium products, they are Sterling Silver Premium Meats/ Cargill Excel and Premium Gold Angus brand. What is Wagyu or Kobe beef? Wagyu is a breed of cattle naturally predisposed to producing densely marbled beef. In fact, Wagyu beef surpasses USDA marbling standards for prime-grade beef. Often referred to as the "foie gras of beef," Wagyu has an exquisitely tender texture and an incomparably rich taste. You may already be familiar with the famed Japanese Kobe beef which is a special grade of beef from cattle raised in Kobe, Japan. These cattle are massaged with sake and are fed a daily diet that includes large amounts of beer. This produces meat that is extraordinarily tender, finely marbled, and full-flavored. It is also extremely expensive, often costing more than $100 per pound.. Wagyu is the same breed stock that yields Kobe beef. To earn the appellation of Kobe beef its production must conform to standards imposed within that region. Marbling is the fine specks of fat within the meat of the beef. While studies show that marbling does not significantly increase the caloric count of beef, without question, it greatly enhances flavor and tenderness. Both of these steaks are of the Choice grade even though there is a noticeable color difference in the meat. The color difference can be due to several different factors. Perhaps a different breed of cattle, exposure to air and oxidation after cutting, the redder one may have been dry aged and the lighter one wet aged. What was the diet, how much grass and or grain may have been a factor. After cooking, they were both delicious! What is aging, wet or dry? Aging is a natural process that improves the palatability of cuts of meat, especially the rib and loin. To learn more about the process, here is an in-depth article from Iowa State University, Department of Animal Science on Aging Beef. Read this from the Arizona Barbecue Association (ABA)---Key Benefits of Dry Aging and How to age beef at home. How do you season a steak? Seasoning a steak before grilling: I rub the steak with a neutral oil such as canola, corn or vegetable. I have even used clarified butter and plain olive oil, however I never use extra virgin olive, walnut, roasted peanut or sesame oil because these oils would give the meat an unnatural taste. This oil rub lubricates the meats and the grill's surface so the meat doesn't stick to the grill and tear when turned. I lightly salt and pepper the steak as well, usually with a blend of Diamond Crystal Kosher salt and ground white pepper. This is a very basic seasoning that eliminates blandness so when a customer at a restaurant takes his first bite it tastes good. As I said above, lightly salt and pepper---you can always add more at the table. I don't rub the steak with crushed peppercorns, chopped rosemary, garlic, sage or anything else for that fact, because it can burn and turn to ashes and impart a bitter/burnt taste. The appearance of the steak is very important too! When first put on the grill the steak should be in the shape it was when it was first prepared. In other words, it shouldn't be flattened by pounding it with the palm of your hand or other device. The steak should be even in thickness from one end to the other so it will cook uniformly. The best way to achieve a good looking steak as opposed to one that looks like a truck ran over it is to cup your hands and push inwards while holding your hands around the edges of the steak. This will plump the meat and return it to its original shape. It is now ready for grilling. Whatever the type of grill you use, it must be very hot in one area, then have areas of less intense heat in other areas. When to turn the steak? What doneness to cook? How to eat a steak? I like my steak cooked medium-rare with salt , fresh ground black pepper, a little melted butter and fresh chopped parsley or chives. The key ingredient to my enjoyment is a very sharp knife. I can't stand restaurants that buy great meat and only present you with a cheap serrated knife that couldn't cut butter---it defeats the purpose of Prime meat and makes it seem inferior to what it actually is. 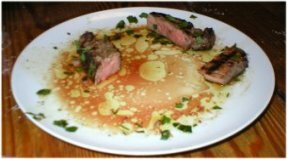 One of the best parts of a steak meal is the juices that are left for dunking bread in. I prefer a crispy loaf of French bread because it doesn't compete with the flavor of the steak and its juices. I must confess that I also like a light caraway rye bread spread with a little unsalted butter. I don't do steak sauce on a really good steak, but on a London Broil or Flank steak I'll enjoy Pickapeppa, a Jamaican Steak Sauce, or Worcestershire and A-1 too.